Theresa May says the EU must "evolve" its stance on the Irish border as she prepares to make the case for her Brexit plans to other European leaders. 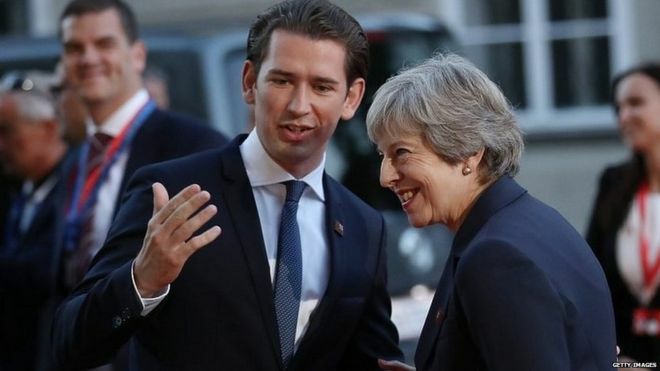 In Salzburg, the PM welcomed the EU's recognition its initial proposal to avoid a hard border in Ireland was "unacceptable". It comes after EU negotiator Michel Barnier suggested a shift in tone on his controversial "backstop" plan. Mrs May said her own Chequers plan would ensure "frictionless trade". The UK and EU both want to avoid a hard border - meaning any physical infrastructure like cameras or guard posts - but can't agree on how. Mrs May has previously rejected the EU's "backstop" plan - which involves keeping Northern Ireland aligned with its trading rules - saying it would divide up the UK. Ahead of the Salzburg summit, Mr Barnier said most checks could take place away from border areas, an apparent concession to the UK. But another key EU figure, European Council President Donald Tusk, said the UK's own plans "will need to be reworked".